T-shirt for Boca Dance Studio | Natalia Sutkiewicz - Graphic Designer Portfolio. Logo, Business Cards, Stationery. 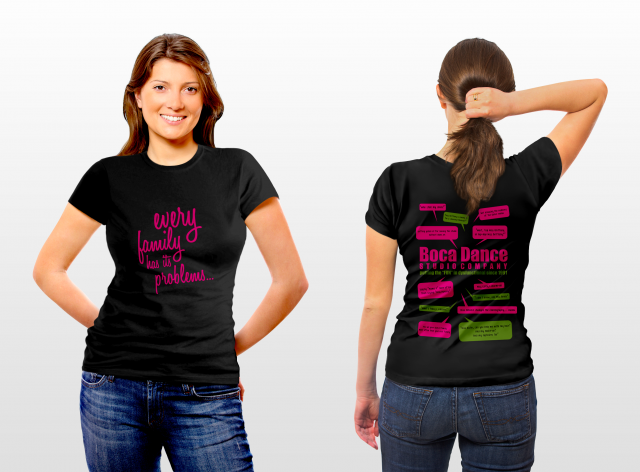 Here’s a simple T-shirt designed for Boca Dance Studio Company from Boca Raton, in Florida, USA. Studio was founded in 1983 and its’ primary focus is to offer the joy of dancing to any interested student regardless of age or ability. They were looking for a black T-shirt with a large slogan on the front, and at the back I was asked to place lots of quotes around the logo. I decided to use very bright colours to make the design more cheerful and handwritten fonts to make it less formal.